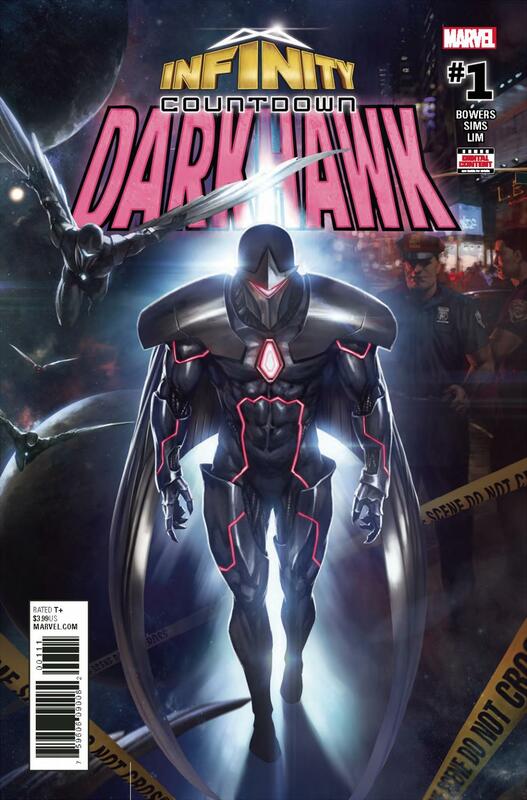 I know nothing about Darkhawk. So, Darkhawk is back, again, and he’s actually got something to do with the Infinity Wars shenanigans that Gerry Duggan is stirring up. I’m surprised he’s here in his own mini rather than just a supporting character elsewhere. Being a mix of a tie-in and build up issue for the obligatory movie synergy event coming late summer, this issue has its work cut out for it. Chris Sims and Chad Bowers tag team this one and deliver pretty well in terms of setting the stage and accurately portraying the characters (as far as I can tell), but don’t do enough in my opinion to capture new readers. Since most people don’t know much about Darkhawk, they take some time to give you the basics. But wasn’t the time to do that in his Legacy one shot? It wasn’t even that long ago. I think the recap page would have been better suited to get us up to speed, that way we don’t waste precious panels. Regarding our protagonist, the recap page basically only says, “he’s stronger now!” This intro feels very much like the first half of a pilot episode of a show that’s a spin-off of a supporting character from the more popular show’s second season, but that show is now on season five. Gang Hyuk Lim excels in bringing to life what events we get, while making this Avatar / Legend of Korra fan feel right at home. Action pieces are definitely the highlight thanks to dynamic panels and easy to follow motion. Faces and hand gestures are not at all exaggerated but still noticeable, making conversations feel more relatable. The colors fit the environment well for the most part, but overall the palette is a little too reliant on shades of blue. I get that a lot of this issue takes place at night, but maybe some more city lights would have been a good way to break things up and keep it fresh.